Create an emergency communication plan. Often local phone lines are diverted and only long distance calls can be made. An out of state contact is encouraged. Establish a meeting place away from your home. 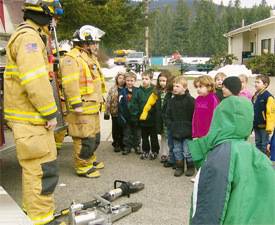 Be aware of your local school's emergency plans. Learn basic first aid and CPR techniques. Check with our fire department for class times and availability. Assemble an emergency supply kit. This kit should be portable, easily accessible from outside your home, and contain enough supplies for a week. Water - one gallon of water per person per day for at least a week, for drinking and sanitation. Food - at least a week's supply of non-perishable food. Battery - powered or hand crank radio and a Weather Radio with tone alert and extra batteries for both. Important family documents such as copies of insurance policies, identification and bank account records in a waterproof container. Sleeping bag or warm blanket for each person, consider additional bedding for cold-weather climate. Household chlorine bleach and medicine dropper for sanitation and drinking water. Books, games, puzzles or other activites for children. Know your community's warning system, disaster plans, and evacuation routes. Stay informed of extreme weather conditions, especially in winter. Know how and where to shut off your power, gas and water valves. Store emergency kits in an easily accessible location. Follow orders for evacuation routes. Drive only when advised or necessary. Help neighbors or others who may need assistance. Call someone, if time allows, to let them know your plan. Do not return home until authorities say it is safe to do so. Be careful when entering buildings or homes that may have structural damage. Service damaged appliances or septic systems. Supervise children at all times until you know the surroundings are safe. Clean up debris and disinfect where necessary. Christ's Church in Elbe hosts a Bread Ministry every Tuesday from 12 pm to 2 pm. On occasion, canned goods, juices, milk and cheese products are also available during this time. There is no charge and everyone is welcome. The Community Food Bank is held the 2nd Thursday of every month (weather permitting) between 11 am and 1 pm at the Faith Baptist Church. The address is 28514 State Route 706 East in Ashford, WA. Faith Baptist Church works with the Eatonville Family Agency to provide this service. A Clothing Bank is also offered at the same time. The Clothing Bank is also availabe on an "as needed" basis immediately following the 11 am and 6 pm services on Sunday as well as the 7 pm service on Wednesday. If you would like to donate food or gently used, clean clothing, bring the items to Faith Baptist Church or the Eatonville Family Agency located at 305 West Center Street in Eatonville. Sheets, blankets, coats, gloves, and other items are also appreciated. For more information regarding the food bank, please contact Cindy Haney at the Eatonville Family Agency at (360) 569-6805. If you are unable to call Cindy from your location, you are welcome to stop in at the Church to use their phone or the phone at the Fire Station in Ashford. For more information regarding the food and clothing bank at Faith Baptist Church, please feel free to stop in at the Church or call (360) 569-0902. Pastor Joe Koehler is available night and day if anyone in the community needs to reach him. The number at the Church is (360) 569-0902 and his cell phone number is (253) 686-5742.